This concert is generously sponsored by the Triangle Credit Union. Mozart's Symphony No. 29, written at the young age of 18 and inspired by a summer trip to Vienna, shapes a concert ending with Beethoven's masterfully-created Grosse Fuge performed by the full string orchestra. We are also performing this concert in Nashua on March 17th. 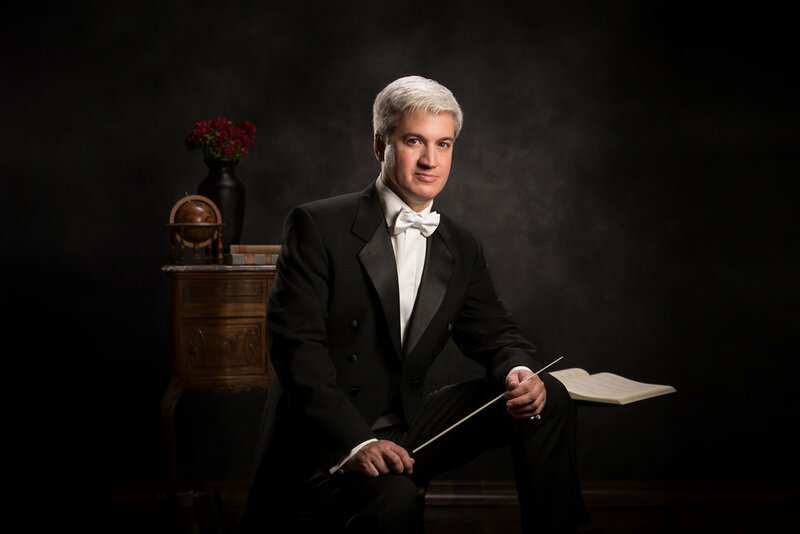 Eric Garcia currently serves as Music Director of the Boise Philharmonic. Garcia previously served as Assistant Conductor of the Seattle Symphony, conducting subscription, education, pops, and community concerts. He served as producer for recordings on the Naxos label and conductor for Brandi Carlile’s acclaimed Columbia Records release: Live at Benaroya Hall with the Seattle Symphony. He has collaborated with such esteemed artists as Marvin Hamlisch, Herbie Hancock, Cirque de la Symphonie, Pink Martini, The Chieftains, Assad Brothers, and Indigo Girls. This concert is also being performed in Nashua. Click below to hear why the soloists for Bach's Brandenburg Concerto No. 2 say the piece is so fun to play and even more enjoyable to experience live. In 1977, NASA launched the Voyager 1 and Voyager 2 spacecrafts, each of which contained a Golden Record in its cargo with representative music and sounds from all of Earth. Three of the composers on this program were represented on this record. The first movement Bach Brandenburg Concerto No. 2 is played. The Beethoven Grosse Fuge was not on the disk, but its sister movement from the String Quartet No. 13, Opus 130, the Cavatina (a short song) is on the disk. Of course you could not represent western music without Mozart, and the Queen of the Night aria from the Magic Flute is on the disk. Alas, there was insufficient space for Britten, but Britten provides a lovely 20th century balance to the earlier works, with its smaller ensembles and the fact that both Britten and Mozart composed these fully mature works despite being still in their teens. Johann Sebastian Bach was one of the most prolific composers in western music. His output includes religious and secular Cantatas (of which, sadly, only around 220 are extant), other vocal music such as motets, passions, Magnificat, and B minor Mass, keyboard works for organ and clavier (a generic term for the various keyboard instruments) including the massive and somewhat radical two books of the Well-Tempered Clavier (WTC) presenting matched preludes and fugues in all major and minor keys, sonatas for unaccompanied violin and unaccompanied cello, and a body of orchestral works highlighted by concertos for one or more violins, one or more keyboards, and the Brandenburg Concertos for many different combinations of solo instruments. All of Bach’s solo works greatly expanded the virtuosic limits of playing for his time. He was never averse to reusing good tunes for other purposes, for example choral works such as cantata movements appear in concertos and vice versa. Bach spent his early years in Weimar as court organist, concertmaster, and composer of a new cantata each week. During the years 1717-23 he worked in Köthen as music director with no church duties (it was Calvinist, not Lutheran), where he wrote the Brandenburgs as well as Book 1 of the WTC. He finished his career and life in Leipzig as cantor and music director of the St. Thomas Church and School. There are 6 Brandenburg Concertos, dedicated and presented in 1721 to Christian Ludwig, Margrave of Brandenburg-Schwedt. These scores were lost around 1734, but fortunately were rediscovered in 1849. Bach used a diverse collection of solo instruments in the 6 concertos, including oboe, bassoon, horn, piccolo violin, flute, keyboard, viola, and viola da gamba. The second concerto was scored for four solo instruments: clarino (natural, i.e. valve-less, high trumpet), recorder or flute, oboe, and violin. The movements are Allegro, Andante, and Allegro assai. The first movement presents the theme throughout in a kaleidoscope of instrumental combinations, sonorities, and colors. Alternating periods of tutti orchestra and varying solo instruments provide this diversity. Often, while one instrument is playing its solo, another solo instrument will comment contrapuntally, very much like a busy modern jazz ensemble. The second movement in triple time leaves out the trumpet to display a more intimate character of equals engaging in a friendly discussion of the thematic material. There is a back and forth among the soloists, who seem at times to continue or finish each other’s statements. A continuous line of eighth notes in the cellos and basses provides forward direction. The fugal finale in duple time starts with the declaration of the subject by the trumpet, as if to remind the listeners that it is still there. The subject is picked up in turn by the oboe, violin, and flute, and even the cello and bass take a turn playing the subject. Bach continues and concludes the piece in his classic jolly and cleverly contrapuntal manner. The Great Fugue has as many musical measures as the other 5 movements combined, though being faster it takes “only” roughly 17 minutes to perform, less than the 28 minutes for the rest. The quartet met with mixed reactions from the public, and the publisher convinced Beethoven to write an alternate final movement, which he did as his last major work only months before his death. Since then, the Fugue has been played either alone as Op. 133, or as the “true” final movement of Op. 130, or even, as in a memorable performance by the noted Guarneri Quartet, as one of both finales played in a single concert, both preceded by the magical Cavatina. Beethoven was prompted to write a version for piano four-hands after seeing one by Anton Halm which did not meet with his approval. A string orchestra arrangement seems more appropriate when one considers the grand scope and massive bowed string instrument sonority of the piece. The fugue has multiple themes. The first subject uses both chromatic half steps and angular long jumps between long notes. This theme bears a close resemblance to the opening of the String Quartet Op. 132, first performed a few months earlier, and even to the Fugue in B minor from the first book of Bach’s Well Tempered Clavier. The second subject is a different character, with quick, almost percussive notes in succession, in a short/long, short/long, short/long, rhythmic character with the accent on the long note. The third subject is more legato with even notes in a rising tune. Finally, Beethoven uses trills to provide textural contrast. Many times, Beethoven has two subjects playing simultaneously, hence the labelling of the piece a “double fugue.” Other gestures include manipulation of the subjects—played upside down, backwards, and rhythmically compressed—and different lengths between the first and second entrances of the statement of a subject. Arnold Steinhardt, first violinist of the Guarneri quartet, called it "Armageddon ... the chaos out of which life itself evolved." Mozart was 18 years old in 1774 when he composed his 29th Symphony in A, arguably the crowning achievement of his early symphonies. He had visited Vienna the previous summer and was exposed to Joseph Haydn’s newer symphonies and was influenced by these powerful and expressive works. By the time Mozart’s 29th was composed, Haydn was already midway through writing his 104 symphonies and had brought the symphonic form into a new phase of maturity. Haydn is widely considered to be the father of the symphony and the reciprocal relationship between these two composers figures prominently in the evolution of the Viennese classical tradition. Mozart’s precocious talent is on full display in this expressive work, which demonstrates the teenaged Mozart’s musical maturity. The first movement is written in sonata form, with two themes presented, developed and subsequently recapitulated. The first theme consists of an ascending line that is played twice by the violins. The second theme is also introduced by the violins and a recurrent trilling is featured. The second movement is more intimate and languid and sets a somewhat nocturnal mood. The third movement is a minuet in triple meter that features thematic material that Mozart develops imaginatively. The opening theme is initially presented in the major key before minor key elements are introduced and a conversation like exploration is undertaken musically. The work concludes energetically, with “hunting” themes and an ascending line played on strings before the closing chords.